For over eight decades, Nigerians have been making use of vehicular road transport. During the First Republic, night-time road transportation existed in Eastern Nigeria as a deliberate government policy. 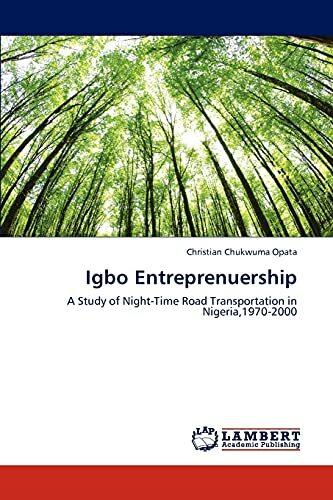 Since the end of the civil war in 1970, night travels by road have become increasingly fashionable for a variety of reasons and the Igbo have continued to hold sway in this business either as service providers or as ``consumers’ of the service. Incidentally, many Nigerians - some of high profile and opinion leaders - have vehemently condemned road transportation by night and have called for its ban. As would be expected, many Nigerians tend to hymn the opinions of such persons, assuming such opinions to be authoritative. The truth though is that such opinions have been based more on emotion than substance. The question then is; is night transport by road as dangerous and unproductive as some commentators have canvassed? Is it not imperative that proper research should be conducted into this matter before we can “pontificate” on it? Dr. Opata Christian Chukwuma is of the Department of History and International Studies, University of Nigeria, Nsukka. He is an economic historian with special interest in traditional Igbo economy.